Life teaches you on a daily basis, based on incidents and decisions you undertake. There arrive such times in life, rarely, which get you to another level of understanding of the concept of being alive! Such moments define the person who you are and help you grow more. I’ve had a lot of incidences in my traveling life, but this particular one will be regarded as my first survival challenge! It was my first day in a foreign country, France. I woke up in my dorm bed, where last night I took refuge to give rest to my aching body post a 15-hour flight from India. As I opened the window, the chill in the air shook me up and the beautiful surrounding filled me up with an extravagant feel and the realization that I was in the City of Love, Paris! My first ever trip to a distant land and that too alone, hardly dreamt of had some true in its own sense! I recollected my last night, diving down the flight of stairs from the airport to the tube station, and then heading to Gare du Lyon, to walking down the streets to find my hostel, a colorful abode. The night I spend few hours in the red painted hall, filled with people from every continent of the world. I remember this distinct person from Hawaii islands. Then there was this guy from Sri Lanka, America origin, had a toy factory on the Lankan Island! Also there was a young lady from Spain, another travel freak and a guy from Argentina exploring Europe. We had a nice chat till late night knowing each other, which concluded with a soulful song by the gentleman from Hawaii who played his tambourine and told us stories about the volcanic island. That night shall forever remain in my memories. I had a long day ahead and a long list of places to visit before I left the city. I had planned to take a night train from Paris, France to Milan, Italy where I was supposed to stay for 2 days. I head over to the main station Gare du Nord where I enquired about my tickets for the night train. There is when things turned over me, the train was full and I could not get reservation on my pass. I had to pay additional 147euros for the ticket which was not at all possible for me. So went out worried and in a lot of dilemma of how to spend the night in the city? It was a weekend and the nearby hotels/hostels were full. I made a few calls to friends who had been to Paris and asked what could be done. One of them, Pranoti, was there for her intern and had managed to stay in the Gurudwara on the outskirts of the city. I roamed around well the entire day, visited the majestic Eiffel tower, and fulfilled my plan of eating ‘French Fries’ in France and a weirdly tasting Ham & Cheese sandwich. Also did a bit of shopping near the Arc de Triomphe and got myself a Zara Blazer! That was one of the best times, but somewhere I had a fear of how was I going to spend the night, most importantly, where? After meeting a few Indian Sardars at the Eiffel, I got the address of the Gurudwara, which then seemed to be a relaxing moment was going to shook me to the core. Late evening I returned to my hostel to collect the baggage, and on the station got myself tickets for my onward journey. God bless that girl at the counter who gave me a fairly good deal and helped me set my itinerary till Rome, Italy which was 1800 kms away! I wakled in peace to the train, which led me to the outskirts, at a station called Le Bourget. Now the real story begins. I got a lil goosebumps too! I got down, a lonely place, kinda scary and asked for directions. The people there led me somewhere inside the locality. First ever day in a foreign land with no notion of whether I was going the right way, the growing dark night and scary people all around damped my soul. Thanks to my traveling experiences, I had hope and kept the search on. 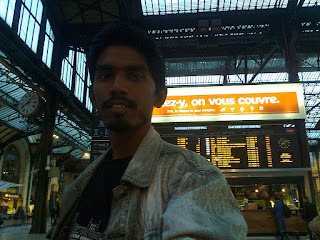 On the way, I met a French guy, (the locals are really helpful) who seeing me confused and alone walked along with me. I dragged my luggage and blindly followed him, trusting my instincts. We walked out a few blocks to a main road, where I met two Sri Lankans. One of them could understand English, and the other could speak French, what a combo! Somehow I explained my state to them and from the discussion we 4 people had made me sure I was in the wrong place! It added to all my worries and fears, and since there was no hotel nearby I was stuck where to head. Good Lord I met those people who were highly supportive to a fellow Asian, and guided me. I finally took a decision to head to the airport, as it was the safest place I could spend the night at, and after the entire day, I had almost no energy left within me. Those guys were good enough to accompany me to the train station and waited till the train arrived. I was brought forward this reality by them that the place was a breeding crime hub and if any anti social had found me, no one could ever find me again! That shook me to the core. They even had offered me their place to spend the night, but if anything happened to me during the night, they would have been in deep trouble. I had all these words echoing in my head as I reached the airport which was not far away. I went up the way I came the previous night, only to find the waiting rooms closed! Only place available to relax were the chairs in the space. I took a deep breath, found all my senses and made my mind that tonight you survived a great ordeal, that I was safe and I had to keep myself awake all night to take care of my stuff! I found a beverage dispenser and made myself cozy at a chair near it. There were a handful of people around me, which built a little more assurance inside. It was freezing cold, almost 6-7 degrees and it was a huge open space. I took all the warm clothes I had, wrapped up and sat still. The entire night I was in different thoughts, gulping down hot chocolate and coffee at intervals to keep myself warm. It was then I realized of what kind of situation I had grown out of, survived a city in a foreign land, in my first ever visit abroad.